Biotechnology is a hands-on program that combines traditional plant and animal breeding with genetic engineering techniques to develop, modify, or improve living organisms. 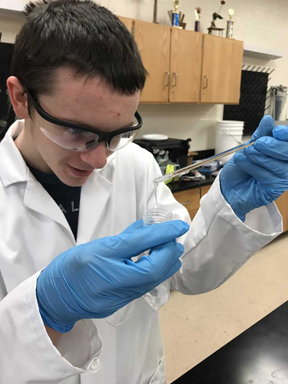 Students will learn to use a variety of laboratory equipment including laboratory glassware, volumetric and electrophoresis equipment, spectrophotometer, centrifuges, autoclaves, microscropes, PH meters, and many other technical laboratory tools. Instruction will include principles of scientific research; microbiology; genetic transfer; genetically modified organisms; and Biotechnology in plant science, animal science, medicine, and ecology. This course will help students to understand the important role biotechnology serves in today's global. The Biotechnology program incorporates high academic standards that will help prepare students for post-secondary opportunities. Examples of post-secondary institutions are Penn State University, University of Delaware, and Allegany College of Maryland.